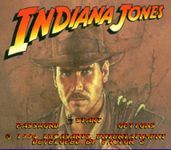 The game is primarily action based, and the player controls Indy through levels based on events of the movies. Indy's main method of attack is his bull-whip, but he can also damage enemies by punching or rolling into them. Occasionally a gun can be found that has unlimited ammo, and grenades are available in limited numbers. Besides attacking, the whip can also be used as a method of swinging across pits. Once in a while, the game breaks the mold from the typical action and plunges the player into various other types of gameplay, such as flying a plane, riding a mine cart, and going down a mountain on a raft. Source: Wikipedia, Indiana Jones' Greatest Adventures , available under the CC-BY-SA License.